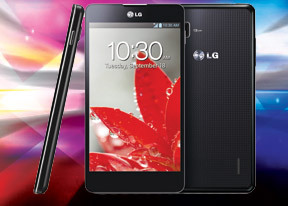 The LG Optimus G is certainly the best-built LG smartphone we've seen recently and it really feels great in the hand. The slim waistline certainly benefits the overall looks and even though we are not very fond of the fingerprint-attracting back panel, we really like the design. The front and the back of the LG Optimus G are covered in glass. The sides of the handset are made of plastic, which has been manufactured through a process using a six-axis laser for extremely high quality and durability. The reflectivity of the Optimus G screen is about on par with the Apple iPhone 4, which means that it's not the best around, but sunlight legibility shouldn't be an issue nonetheless. The viewing angles are great if look directly from the sides, but if you turn it to a 45 degree angle the IPS screen leads to the usual color-shift and contrast loss. The Qualcomm Snapdragon S4 Pro chipset is doing a great job of keeping everything perfectly smooth. Even without Jelly Bean and its Project Butter we experienced no lags or holdups while handling the LG Optimus G.